Laminate Flooring | Owen Sound, ON - Greyfair Flooring, Inc. Enhance the value and appeal of any room when you add our strong and stunning laminate flooring. When you begin the planning process for any remodeling project, it helps to have a proven home improvement partner with access to some of the most trusted flooring brands on the market. Our showroom is stocked with a broad selection of laminate tile and laminate wood flooring that add style to any room or area in your home. If you are unsure of which look to go with, bring your design plan to our showroom and discuss your ideas with our flooring specialists. Our design team and our sales associates are ready to take you on a tour of our expansive showroom, so you have a chance to see all of our stunning laminate collections. As you explore your options, our flooring professionals are here to help you identify the right type of plank laminate for your home. When you need ideas that can help you maximize the impact of your home improvement project, we are happy to help you find the perfect style for any space. Instead of settling for the worn and faded flooring you have been living with for years, create the home interior you have always imagined with an investment in flooring made from laminates. Enjoy the warmth and character that comes with natural-looking wood and the durability of cutting-edge laminate wood flooring when you make your next flooring purchase at our showroom. It is hard to go wrong when you are able to choose from a selection that includes major names like Mannington and HomeCraft. Once you have chosen your new laminate floors, it makes sense to protect your investment by having it installed by our skilled and experienced installers. Our contractors take exact measurements, so you always get the best fit possible for each room. One of the most important selling points with our laminate wood floors is the structure. This particular type of laminate flooring is manufactured with several layers, all of which improve its durability, appearance, and the comfort underfoot. Advancements in the manufacturing techniques have greatly advanced the style and durability of this popular home flooring. Unlike the laminate floors of the past, today’s laminate tile and plank floors are engaging and enduring. If you are interested in the natural look of wood and tile, but expect a heavy amount of foot traffic through the room in question, this flooring alternative may be the best way to go. Backing Layer: This initial layer of laminate stops moisture from seeping into any of the above layers. Substrate Layer: Set just above the backing layer, this substrate layer gives the flooring a strong and solid feel underfoot. Pattern Layer: This layer, which is second from the top, is responsible for authentic look and feel of wood and tile. The pattern and grain that is the result of this installation process comes primarily from this portion of the floor. Wear Layer: The gloss and strength of your new flooring investment comes from this surface layer. Your floors are able to withstand years of damage and constant foot traffic thanks to this protective layer of laminate. Natural wood flooring is great for cozy dens and stylish offices, but it may begin to warp and stain when exposed to moisture and other liquids. This has traditionally limited the use of this stunning variety of flooring in places like finished basements and kitchens. 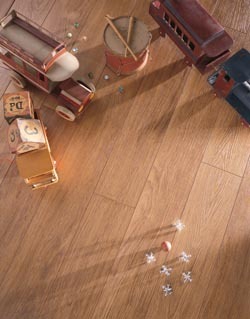 With our selection of wide plank laminate, you can now have the character of hardwood with the resiliency of laminate. Expand your design horizon and include the warmth and appeal of wood in your new kitchen without the traditional complications. Laminate tile flooring is easy to maintain, durable, and attractive. Our customers love the look and feel of this flooring under their feet. Visit our store to see just how authentic laminate can look when compared with such high-end materials as hardwood and natural stone. Laminate tile flooring is perfect for high-traffic areas and moisture rich environments because it will not wear down even after years of heavy use. Protect the investment you have made in your new flooring by establishing a partnership with our installation contractors. These experienced professionals have the right tools for any installation project you have in mind, and the resulting fit is sure to look great and last for many years to come. Our selection of laminates won’t wear down quickly when subjected to heavy foot traffic, and the resulting patterns are sure to be unlike anything you have ever seen. Get back to the business of living your life, and enjoy a home with added value and appeal. If you are considering placing your home on the market for sale, there is no better way to catch a potential buyer’s eye than having new laminate wood and tile floors installed by our effective and efficient contractors. Contact us today to schedule a free in-home consultation about laminate tile flooring with our professionals. We are proud to serve clients in Owen Sound, Port Eglin, Wiarton, Kincardine, Hanover, Meaford, Flesherton, Tobermory, ON, and the surrounding areas.